Choosing the Right Information : Where Can I Find It? 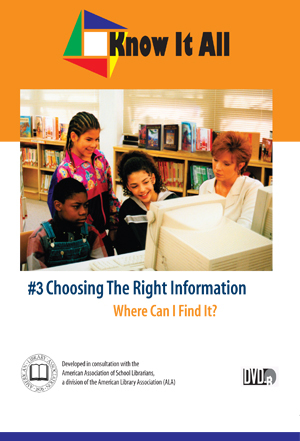 Home > • Language Arts > Know It All > Choosing the Right Information : Where Can I Find It? After rescuing a turtle, Allie and Tyler discover that its continued survival depends on very specific, reliable information. When their efforts to find answers to practical questions are frustrated, they turn to the school’s media specialist who leads them through a variety of resources—print, electronic, and human—to find answers. Your students learn how to evaluate information sources for validity, accuracy, and relevance to their problem.